The Meeting of the Lord in the Temple (also called the Presentation) is one of the Great Feasts of the Orthodox Church, celebrated on February 2 and February 15 (according to Old Calendarists), using the Gregorian Calendar, Julian Calendar, and Revised Julian Calendar. This feast is also known as Candlemas, particularly in Western nations, due to the custom of blessing candles on this day. 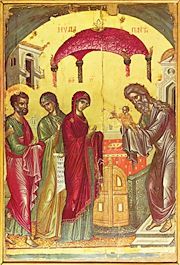 In Eastern tradition, it is often called The Meeting of Our Lord and God and Savior, Jesus Christ, because the hymns emphasize the incarnate God, the Lord Jesus Christ, meeting with his people, Israel, in the persons of the Prophet Simeon and the Prophetess Anna. In the Gospel of Luke 2:22-35, Mary and Joseph took the infant Christ to the Temple in Jerusalem. He was received in the arms of the elder Simeon, who then prayed, "Now let Thy servant depart in peace... for I have seen Thy salvation." This was one of the things that Mary "pondered in her heart"—the fact that others recognized that her Son was the Messiah. On the eve of the feast, Vespers is served and contains three Old Testament readings. The first is a composite of Exodus 12:15-13:16, Leviticus 12, and Numbers 8. The second reading is from Isaiah 6:1-12. And the third is a composite from Isaiah 19:1,3-5,12,16,19-21. Sometimes Matins is served on the morning of the feast. The Gospel reading is from Luke 2:25-32, where St. Simeon receives Christ. Divine Liturgy is served on the day on the feast. The epistle reading is from Hebrews 7:7-17, and tells of a change in the priesthood: what further need was there that another priest should rise according to the order of Melchizedek, and not be called according to the order of Aaron. For the priesthood being changed, of necessity there is also a change of the law. The gospel reading is taken from Luke 2:22-40 telling of the Most Holy Virgin, who had no need of purification, since she had given birth to the Source of purity and sanctity without defilement, humbly fulfilled the requirements of the Law. 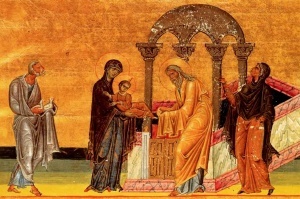 It tells of St. Simeon who receives Christ, and his words: Lord, now let Thou Thy servant depart in peace, according to Thy word, for mine eyes have seen Thy salvation, which Thou hast prepared before the face of all people, a light to enlighten the Gentiles, and the glory of Thy people Israel. And his words to the Most Holy Virgin: Behold, this child is set for the fall and rising again of many in Israel, and for a sign which shall be spoken against. Yea, a sword shall pierce through your own soul also, that the thoughts of many hearts may be revealed. The reading also tells about the 84-year-old widow Anna the Prophetess. The theme of all these readings together, tell of the changing from the Old Testament to the New Testament, the old law becomes something new. The Son of God, giver of the law, now himself fulfills the law, being carried in Simeon's arms as a human child. The forefeast of the Meeting is February 1, and the leavetaking of the feast is February 9, although the afterfeast of the Meeting of the Lord may be shortened or omitted altogether if February 2 falls on or after the Sunday of the Publican and Pharisee. Rejoice, O Virgin Theotokos, full of grace! From you shone the Sun of Righteousness, Christ our God. Enlightening those who sat in darkness! Who grants us the Resurrection. And did bless Simeon's hands, O Christ God. Now You have come and saved us through love. Grant peace to all Orthodox Christians, O only Lover of man! And in amazement sings with us a pre-festal hymn. And is given into the arms of the priest and Elder. Let us worship Him, our True God. This page was last edited on October 23, 2014, at 20:45. This page has been accessed 54,163 times.